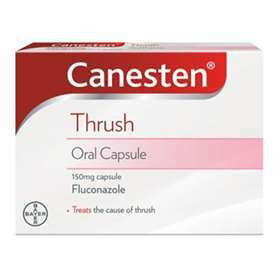 The Canesten Oral Capsule is an effective, single dose treatment for male or female thrush. Simply swallow with a glass of water at anytime of the day. Your symptoms should begin to clear within 2 days. For more information on thrush. Inactive ingredients: Lactose monohydrate, Maize starch, Colloidal silicon dioxide, Magnesium stearate, Sodium lauryl sulphate, Brilliant blue FCF (E133), Titanium dioxide (E171), Gelatine, Black iron oxide (E172), Shellac, Soya lecithin. Fluconazole, the active ingredient in the Canesten Oral Capsule, is an antifungal. Do not use if you are pregnant, breastfeeding, under 16 or over 60. Remember: thrush can be passed from partner to partner and back again. If you are treating yourself for thrush, it is advisable to treat your partner at the same time to avoid re-infection. You may also like to try Canesten Duo, which is the same as this capsule but with an additional 10g of Canesten Thrush Cream.